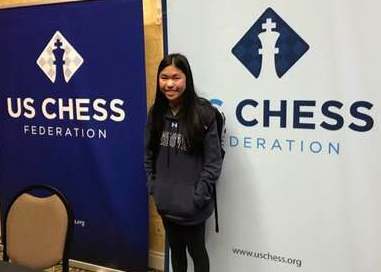 Carissa Yip, champion of the Wachusett Chess Club in 2014 and the Boylston Chess Club in 2016, tied for 2nd place in the 2018 Denker Tournament of High School Champions, held July 28-31 at the Madison Marriott West Hotel in Middleton, Wisconsin. The 14-year-old Woman International Master from Andover, Mass. scored 5-1 (five wins, one loss) to share runner-up honors with IM Joshua Sheng (rated 2550) of California. Carissa's only loss was to IM Praveen Balakrishnan of Virginia (rated 2522), who scored 5.5-0.5 to win the Denker Tournament for the second year in a row. Carissa earned the Ursula Foster Award for being the top-scoring player under the age of 16. And, as she said after the tournament. "And I'm over 2400 again!" Carissa's USCF rating is now 2407. A total of 48 players competed in the event.